We're only days away from the Google Pixel 3 and Pixel 3 XL's official unveiling on October 9, but that doesn't mean the teasers and easter eggs are ready to stop just yet. 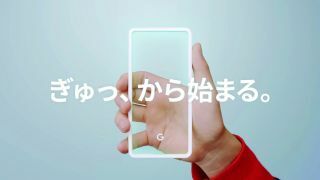 The latest Pixel 3 preview comes to us from Japan, with a fun new video that hints strongly at the return of Active Edge technology, which gave Google's Pixel 2 range squeezable sides for an additional level of control. You can check out Google's adorable Pixel 3 teaser video below, which features numerous hugs, grasps, grips and squashes – hey, we never said Google's hints were subtle! According to 9To5Google, the video also seems to hint at possible color options for the upcoming Pixel 3 range, with previously-rumored shades of white, black, pink and mint green showing up numerous times throughout the short teaser. That said, yellow and light blue also feature prominently during the video's 40-second runtime – could it be that Japan is set to receive additional color variants? Admittedly, all we have is speculation at this point, though we can expect the Pixel 3 to sport the latest Android 9 Pie version of Google's mobile OS, along with a Snapdragon 845 chipset when it launches in one week's time.